Is there anything more charming than a good old fashioned window box full of flowers? 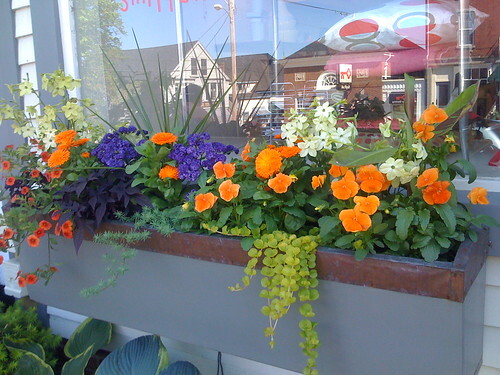 Even if it’s just old fashioned flowers like impatiens and geraniums, a window box cannot be beat. Here are a few simple formulas for windowbox success. Start simple. It doesn’t have to be more than one variety of flower and hell, it doesn’t even have to be attached to the window. Sticks some pink geraniums in a rectangular planter, plop it on the wall or on a table and you’re done. Easy. Same goes for lavender, or any herb for that matter. Especially if you’re in an apartment and want easy access to basil or rosemary – just plant it in a window box outside the kitchen window. Go a little patriotic. Red, white and green. Impatiens and begonias look great from Memorial Day through the Fourth of July and may even keep on trucking through Labor Day. BTW, Creeping Jenny is available in some states, though you may have trouble finding it in others as its on the old invasive list. If you want to go super-patriotic, add some bluish-purple salvia or ageratums. Go for a wildflower look. Lots of greens and dangling vines go great with a rustic garden. Verbena, sweet potato vine and trumpet creeper are good choices that will hang below the box. Go for it. 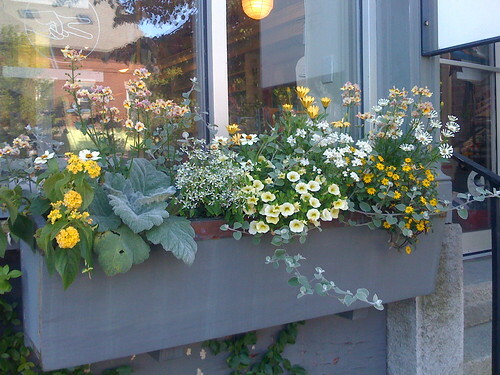 Once you’re comfortable with designing with window boxes, throw everything you know will work in there. So long as you have the right light, drainage, and check to make sure certain plants won’t become too large for the box, pack ’em in. Additionally, I always like to reassess a box after two weeks to see if it has any blank spots. It’s never too late to fill in with more plants, or replace one that has not fared well. I love the brightly colored rectangular planters from Loll Designs for getting a window box started. They are great on railings or down the center of an outdoor dining table, and they come in several great sizes and colors. 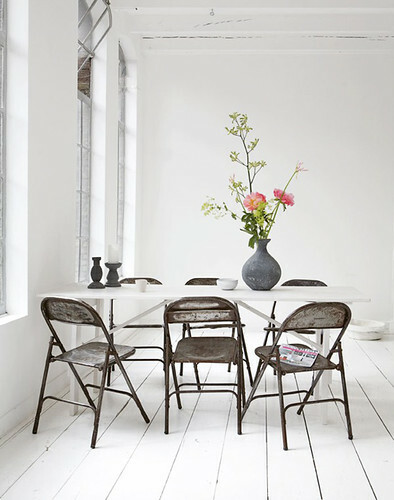 …that six old folding chairs could look SOOOOO beautiful when placed in an all white loft dining space? 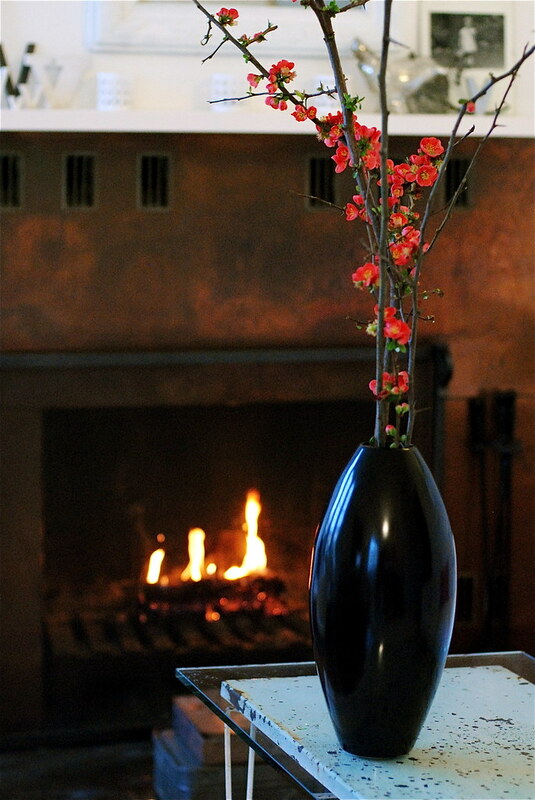 Of course, it doesn’t hurt that the flower arrangement looks like a MoMA-worthy work of art! Thanks so much to Danielle de Lange of The Style Files for sharing this photo on Flickr! This flickr fave comes from the amazing and talented Victoria, a.k.a. sfgirlbybay. She’s such a blog superstar that it always gives me a little jolt when I see she’s bothered to contribute to our Fresh New Spaces group! This picture is for those of you that still are not seeing a bud on a tree and still expect snow, and to remind you that blossoms can warm up and cheer you no matter how cold it is outside. For some of us, it’s a perfect time to clip some branches and force those flowers out indoors. We are at the peak of some beautiful blooms right now all across the country, so I thought I’d share a few favorite florals. The incredibly talented and creative Victoria shared this shot of some lovely domesticated wildflowers from the Alemany flea market. P.S. Victoria, I saw you quoted in The New York Times this weekend regarding “Keep Calm and Carry On.” I think this arrangement can help with doing just that! My pal Chad just sent me these shots in an email today. He took it at the University of Delaware Botanical Gardens. I love that he captured this hummingbird so well – it must be hard to get a good shot of something that moves around so quickly! Hey All! I’m out of town, and thus today’s Flickr Faves on Fridays are all cruddy quality pictures taken from my phone, because I don’t really have a fast enough connection to browse flickr today. These are all charming container gardens I’ve snapped after lunches this week, the first in Atlanta and the rest in Maine. 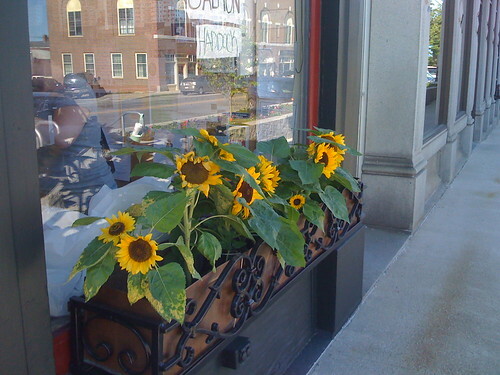 I don’t know what it is about where I choose to eat lunch, but after lunch at Red’s Eats in Wiscasset Maine two days ago, I came upon glorious windowbox after glorious windowbox. 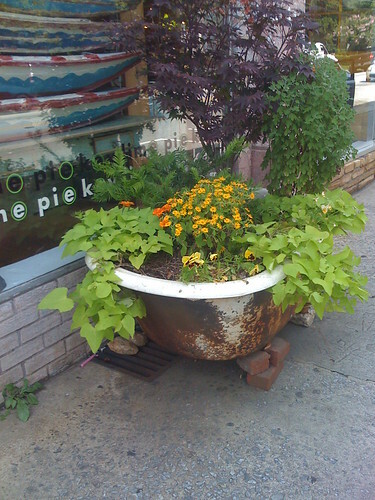 These container gardens have a lot to do with why Wiscasset is “the prettiest little town in Maine”! 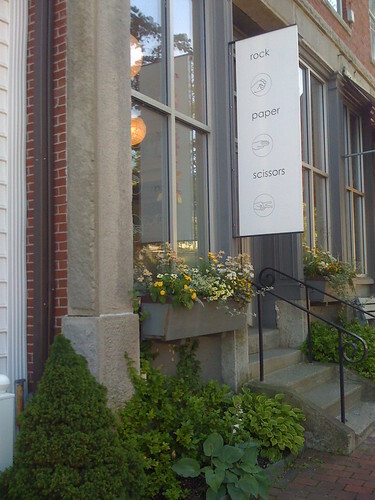 The one below is at a beautiful home store called smitten (same talented owner as rock paper scissors shown above). I was so impressed with the owner’s taste and merchandising skills; I highly recommend a visit if you are on Coastal Route 1!